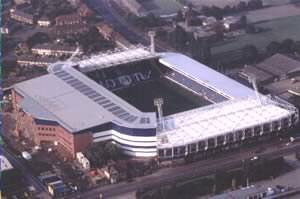 The Hawthorns is a very impressive stadium with much redevelopment taking place in recent years. The ground is now totally enclosed, with the last addition being the replacement of the old Rainbow Stand at the start of the 2001/02 season, with a new East Stand at a cost of £5.25 million. Away fans are normally located in the Smethwick stand behind one of the goals, and are normally allocated part of the seating with this stand. When larger or local teams visit (Wolves, Birmingham City etc), visiting supporters are likely to be allocated the whole Smethwick End. Exit the M5 at junction 1. Take the A41, signposted Birmingham. The stadium is visible from here, and stands about 600 metres to the Birmingham side of junction one. Turn right into Halfords Lane for stadium. The Hawthorns railway station is situated on Halfords Lane, 250 metres south of the stadium itself. There is also a Metro tram link which services the main route from Birmingham to Wolverhampton. Otherwise, from New Street, head for Smethwick Rolfe Street (10 min walk). 74, 77-79 and 450 all pass by the ground. Parking at the ground is mainly for season-ticket holders only although there are places behind the Family Stand, off Halfords Lane, and alongside the Tom Silk Building in Halfords Lane. This car park is supervised, and costs ?4, although it gets full very early. There is some parking on the Halfords Lane industrial estate. Bradfords Bakery (Birmingham Road) open up part of their facility for parking. Note, Halfords Lane is closed on matchdays from 13:30. On matchdays, there is also car parking available at The Hawthorns railway station, a further 50 metres down Halfords Lane. Street parking is limited. None is allowed on the Birmingham Road. WBA should be commended for their efforts on behalf of disabled spectators. The stands behind each goal have disabled areas, with the front row of seats in each of these stands reserved for wheelchairs to be parked in front. The disabled fans also have their own entrance, with ramped access, located on Halfords Lane. This pub is located on Albion Road, West Bromwich [B70 8QX], and is descibed by the manager as 'an away supporter friendly pub.' The Poacher's is a fairly large family friendly pub with a decent size car park. Coaches are welcome, [but please let the manager know, so he can ensure there is enough staff on]. Food ranging from sandwiches/burgers to a 20oz Mixed Grill is served from 12 - 2.30 & 6 - 9 Mon to Sat & 12 - 6 on Sunday. There is a small beer garden & the bar has a pool table & dart board. To find this pub head towards Birmingham on the A41, and you can't miss it! The Royal Oak provides a selection of beers and lagers and also welcomes kids. It is asian run hence the selection of cuisine available. If you are a registered user then you can login, and create your own personal review of West Bromwich Albion Football Club - The Hawthorns. These reviews can be private or public.